A particular type of single ladder is the Gierre extending ladder with rope, ideal for carrying out work inside or outside large structures, when it is necessary to reach heights of up to 14 meters and requires maximum stability. 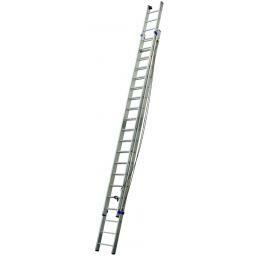 Gierre extending ladders are highly professional aluminum ladders, suitable for use in large structures. They are robust, stable and equipped with a practical lifting pulley with which you can adjust the height: depending on the model chosen, you can even reach 14 meters in height. All models of ladder with rope have wheels placed at the end of the sliding trunk, so as to facilitate opening and closing once the work is finished; moreover, they have a maximum capacity of 150 kg, maximum weight by law, and therefore allow to be used also to carry weights of a certain type. The real comfort of this type of ladders is that, when they are closed, they take up very little space. They can be conveniently stored in your van, or in a small space without creating the slightest hindrance to the workplace. Like all other Gierre work ladders, even the sliding stairs have EN 131 certification, guaranteeing maximum safety. If you need a Gierre sliding ladder, Mister Worker™ is the online store for you: whatever model you decide to buy, we offer you the official guarantee of the manufacturer! If you have difficulty during use, or the scale should arrive faulty, call us at 0291433257 and we will solve all your problems.